Shirts With Random Triangles: 2015 DT prospect Jonathan Ledbetter flips commitment from Alabama to Georgia. 2015 DT prospect Jonathan Ledbetter flips commitment from Alabama to Georgia. What's mine is mine. What's yours is mine. Jonathan Ledbetter. Via Saturday Down South. A highly ranked four-star 2015 recruiting prospect has flipped his commitment from Alabama to Georgia. 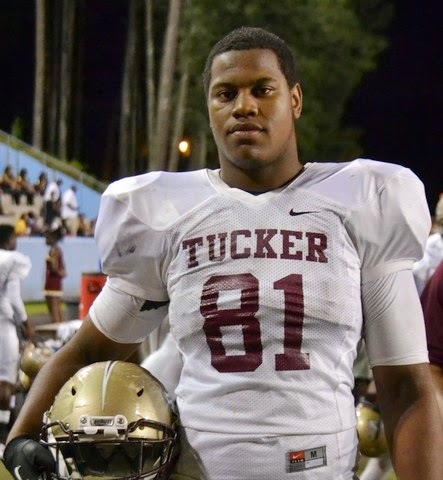 Tucker, Ga. high school senior defensive tackle/defensive end Jonathan Ledbetter made the announcement of his decision to commit to the Bulldogs over the Crimson Tide via Twitter. Ledbetter's brother, Joseph Ledbetter, recently became a member of the Bulldogs after playing basketball for the past two years at Pfeiffer College, an NCAA Division II school in North Carolina. 247Sports.com rates Ledbetter as a four-star defensive tackle/strong-side defensive end. The site ranks Ledbetter at no. 5 among strong-side DE prospects for 2015. He ranks no. 10 among 2015 prospects from the state of Georgia, and at no. 71 among all 2015 prospects. The ESPN300 ranks Ledbetter at no. 62 among 2015 prospects. Ledbetter attends Tucker High School in Tucker, Ga. He stands 6'4, and weighs 265 pounds. John Shaw admits ankle injuries were due to fall.